I’ve run a festival for my players before. They were in a village, managed to defeat a baddie, and the influx of well-wishers, news hounds, gossips, and opportunists soon turned the town into an impromptu two-day party. The heroes got an award from the mayor, there was dancing, and jugglers threw things about. Mostly I ran it narratively. Trying to figure out a bunch of guess-my-weight and dunk-the-halfling mechanics on the fly seemed like a bit much. That’s precisely what Festivals, Feasts & Fairs is meant to address. It provides a bunch of background, color, and mechanics for the kinds of activities our adventurers would find at a festival. Feats of strength, carnival games, fortune telling. It’s basically a set of mini-games that allow your players to use their skills to try their luck on the carnival fairway. The PDF is well laid out in a familiar style, and contains internal links to all sections. My only quibble is that I’d love to see a more comprehensive link list as I would likely run this on my laptop during a session. I think if you generated a few memorable NPCs and had this supplement at the ready, you could fill an entire session with your PCs just wandering around shooting arrows at targets and eating fried foods. If this sounds like something you could use, I recommend it. 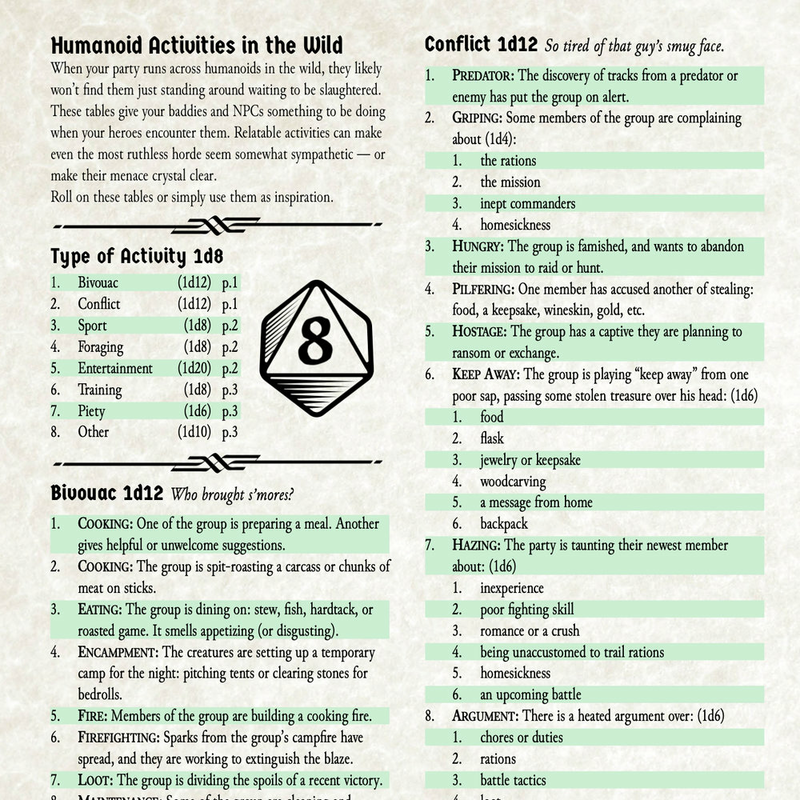 Here’s an update to Humanoid Activities in the Wild, a collection of rollable tables. It’s a list of over 100 things for your baddies to be doing when your PCs encounter them. Now with updated lists and fancy, RPG-style formatting. System agnostic, fantasy flavor for your RPG. I was going to buy some gold metal dice, but I’ve got seven players at my table. So I made these inspiration cards instead. Potions and scrolls. All the 5e card designs I’ve created so far, printed, cut, and ready for play! Download PDFs free on Cryptocartographer.net or Pay What You Want at DriveThruRPG. These cards make it easy to hand out spells as loot, and to help keep these valuable magical items from getting lost in players’ inventory lists. Includes the 8 Scrolls of Protection, 7 blank Spell Scrolls, and a reference card for novice casters. Potion cards for your 5e table. All the potions from the DMG. On the Pronunciation of "Geas"
For a quest to a ghast and a lich. And they wound up undead in a ditch. Use these handy cards to track health potions at your #Pathfinder table. These customizable potion cards are a complement to our previous Healing Potion Cards. Write in the details at the table, or fill in the PDF and have them ready for your next adventure. Healing Potions Cards. There are many like them, but these are mine. And yours, if you’d like them. Simple arrow tracking for 5e using 4 six-sided dice. Don’t write it down in your inventory. Here’s an assortment of dungeon keys for your tabletop. i listen to several DM-centric and a few actual play podcasts. Here are a few of my recommendations. When mother said you mayn’t? Where I was thought a giant! Dundarrow is a prosperous Halfling village of stone and timber structures on the west bank of the Barbulen River. Its industry is based on the agriculture of the surrounding river valley — there is a water-powered mill, a granary, and a brokerage for wheat, oats, barley, and other crops. A brewery produces the secondary export of the village, a popular beer called Stump Ale. The namesake of Stump Ale is the remains of an enormous tree in the center or town. It serves as a stage, a bandstand, a dance floor, a venue for weddings and religious ceremonies, and is a sacred object for the local druids. A stone bridge spanning the Barbulen connects Dundarrow to the eastern bank. This access makes the village a point for trade, provisioning, and rural society. The community hosts a weekly market, a variety of shops, an inn with accommodations for the larger races, and several seasonal festivals. Dundarrow Village began as a tourist attraction. An enormous tree grew by the banks of the Barbulen River. Named Dundulein by the local druids who revered and safeguarded it, this massive living spire brought gawkers from far and wide and a few small businesses sprang up, selling dried pressed leaves fallen from the branches high above, sap mixed into a restorative draught, and splinters of its bark as souvenirs. The tree eventually fell victim to a strange blight. The druids were unable to discover its source, and all their prayers, rituals, and husbandry could not save it. Fearing a spread of the curse into nearby forests, they cast powerful magics upon it, destroying the blight but also killing the tree. The vast tree was now a hazard. It would eventually topple, doing massive damage and conceivably damming the river. The druids agreed that the tree could be harvested for lumber one one condition: that the mighty roots remain undisturbed. It was their hope that someday the tree would gather its strength and put up new shoots. The place where the dead tree stood became known as Dundulein Barrow, then simply Dundarrow. The sleepy tourist stop quickly expanded into a lumber town. A sawmill was built on the river, and the tree was harvested limb by limb. Though the highest branches were perilous to cut, the wood was strong, and clear of grain, and it fetched a premium price. Gradually teams of human and halfling lumberjacks whittled the tree down to its stump. The stump remained as the druids had requested. It was leveled and smoothed into a platform that served as stage, dance floor, meeting place, and sacred venue. As the tree came down, a town went up. The now-obsolete sawmill was converted to grind grain, a granary was built, and the stone bridge across the Barbulen that had once carried a harvest of lumber out from the village began to bear the harvest of the river valley toward it. 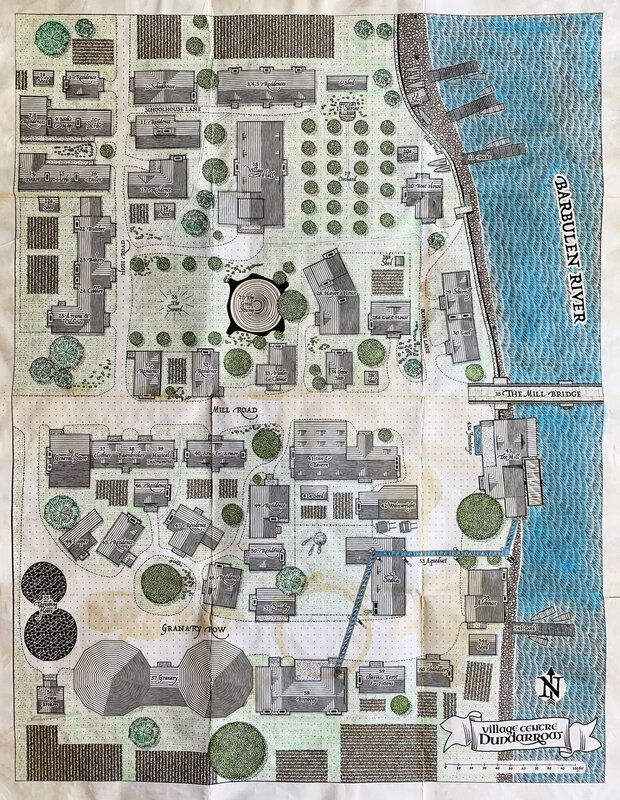 Halflings from the surrounding Holdlands began to occupy this new depot: younger sons and daughters who would not inherit their families’ farms or who simply had an interest in the wider world. The village began to grow in earnest, attracting entrepreneurs, then families, then shopkeepers and artisans. Token for my new bard PC for a new 5e campaign. Vector art in Adobe Illustrator. Tutorial: Creating Freehand Map Styles in Adobe Illustrator. Create stipple and hatch style brushes for mapmaking.